EA Sports President Peter Moore said that he wants the FIFA franchise to ditch the annual roster updates and remain persistent. It's a complaint that's heard whenever sports games come around: Wwhy should I drop 60 bucks on a new game when it's basically a roster update with some "features" mixed in? 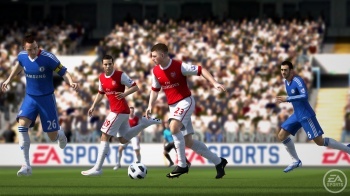 Peter Moore, head of EA Sports, thinks that business model is dead and he wants to see FIFA become like an MMO. EA already has something like what Moore is suggesting in the Facebook game FIFA Superstars but creating that kind of pervasive, persistent world to play football with and against people online is his goal. "We need to provide that persistent world, maybe sometimes powered by discs, maybe on social networks, or the cloud or whatever," Moore said. "That's the team's vision, that no matter where you are or what you're using, there's a FIFA experience to be had, it all links together, it lifts your level up and identifies your status." Maintaining this kind of football franchise will take a shift in staffing. "In a few years time I expect to have less of a team developing and as many if not more doing live operations. "Personally I still think there'll be discs five years from now. But generally yes, of course, I think there will come a time when FIFA is less a disc that you wait for in late September/early October, and more something that we provide 365 days a year." Moore's plan for FIFA was in part inspired by the fact that many teams and players participate in leagues and tournaments the whole year. "Football for most of us is pretty constant," Moore said. "This year there was, what, a 15 day off-season. And even then we were thinking about it and reading about it. That's the space football occupies in our lives and that's how we've got to look at it." So what do you think? Would you subscribe to a service in which you get a constantly updated football videogame that tracks your stats and skill-level over multiple years? Moore states that such a service might be free to play and that EA would make money from microtransactions. "The business model's simple: you accept that the vast majority of users will never pay you a penny and you learn to be cool with that," Moore explained. "Plus you get people like me who want deeper engagement, and can't sit still waiting for their three daily match credits or whatever, so we pay to accelerate our gameplay and create better teams, and that's nice but it's not really the point."